There are as many recipes for roast potatoes as there are cooks. This is my humble submission. My priority here is to achieve a roastie which is crisp and tasty on the outside, soft and fluffy on the inside, and tasty even when eaten cold. I have made no attempt to reduce the calories, salt or fat intake; I believe roasties are, and should always be, a singular indulgence which should remain forever aloof from fad diets. If you choose low fat roasties, you will not live longer, it will just seem that way. To make the best, I use the best, so maris piper potatoes, sea salt and goose fat are the natural choices. 1 bag of maris piper potatoes, peeled and cut into quarters, rinsed and drained. 3 tbsp sea salt (yes 3). 200g goose or duck fat (now available in most big supermarkets). *A roasting joint or bird is not an ingredient of this dish, but the drippings are used to good advantage. Add the spuds and all the salt to the saucepan, bring to a boil and continue boiling for about 7 minutes. Drain the boiling liquor and toss the drained spuds to fluff the outsides. Lift the lid and add several knobs of goose fat to coat the spuds. Transfer the spuds to a roasting tin and bake at 180°C for 30 mins. A roasting joint suspended above the roasting tin on a wire rack will spatter the roasties with an extra layer of tastiness. Turn each spud to ensure even cooking and continue to roast until they are crisp and gently browned with slight scorching in places. You can time your meat joint to be removed 10 mins before the roasties; this will give the meat time to rest and firm up for better carving. Only with roasted meat, three veg, Yorkshire puds and a meaty gravy. If you want the best recipe for Yorkshire pudding, check this out. The reason for the high amount of sea salt is to help with the crisping of the outside of the roasties. 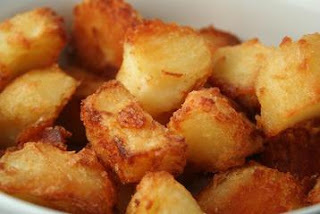 This method also has the effect of reducing the fat absorption of the roasties, keeping the insides light and fluffy. Goose or duck fat imparts a rich flavour, has a high flash point and will not burn at the high temperatures employed here. For these reasons, the best chips are also maris pipers cooked in goose fat.